We all have those people we admire and aspire to when growing up. It might be an athlete, musician, astronaut, actor, what ever, but we all have those people you know had some affect on the direction our life takes. This past weekend, at the FanExpo Vancouver, I actually got to meet one of those people in person. I remember when I was a kid, maybe 10 or 11, I would sit on the floor in my brothers room for hours flipping through his Palladium Rifts books. 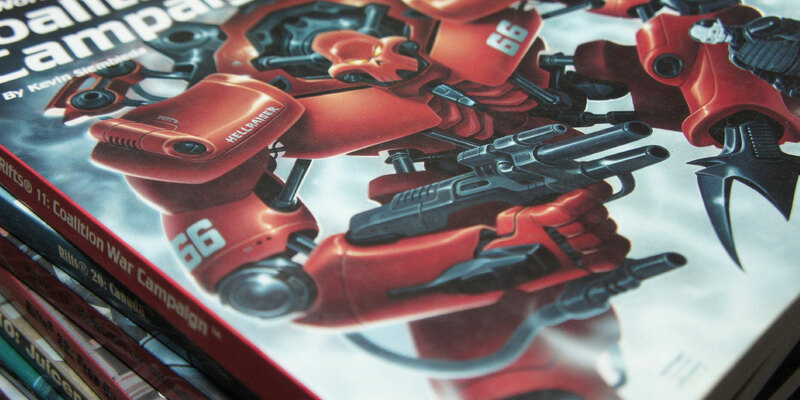 I loved checking out all the cool illustrations of mechs, creatures, & characters, etc. I would constantly be looking at these while drawing, trying to replicate my favorite robots, adding sweet new weapons & paint jobs to them, and creating my own characters I imagined wandering around in this world. Since I grew up in a fairly rural area, and the internet definitely wasn’t an easily accessible reference tool for us, these books became a favorite source for sci-fi illustrations. These books were particularly interesting for me because they had a variety of illustrators all interpreting the same world & characters in their own way. There was definitely a few specific artists I was drawn to more, but one style just kept me interested and wanting to see more, the signature simply read ‘PéREZ’. As the years went on, and the collection of Rifts books kept growing, I had more and more reference to look at. 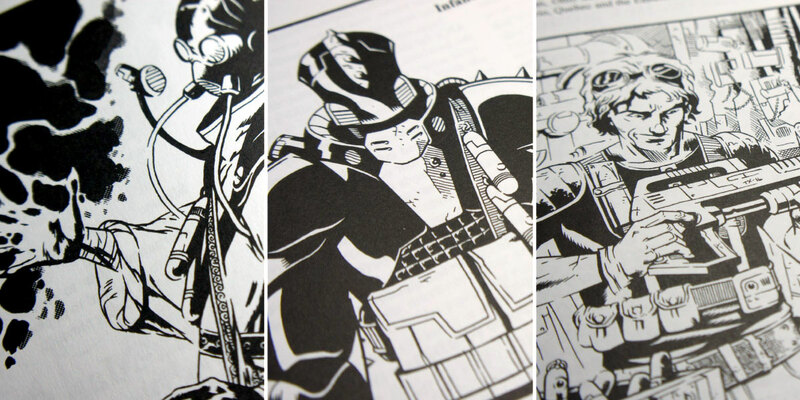 I was always excited to see what amazing new creatures, armour, and machines were being created in the new volumes. One day my brother brought home a smaller ‘sourcebook’ that he was pretty excited to show me. I thought it was just a thinner, and therefore less drawing-filled, version of the normal volumes and wasn’t too interested. He pointed out a short section of a comic to me and I immediately recognized the style of PéREZ. I was super excited to see this… Not only was it my favorite artists comic, but after reading a few issues, it made me realize the next step of how I wanted to improve my own style and approach to drawing. It showed me the importance of knowing your subjects & environment. 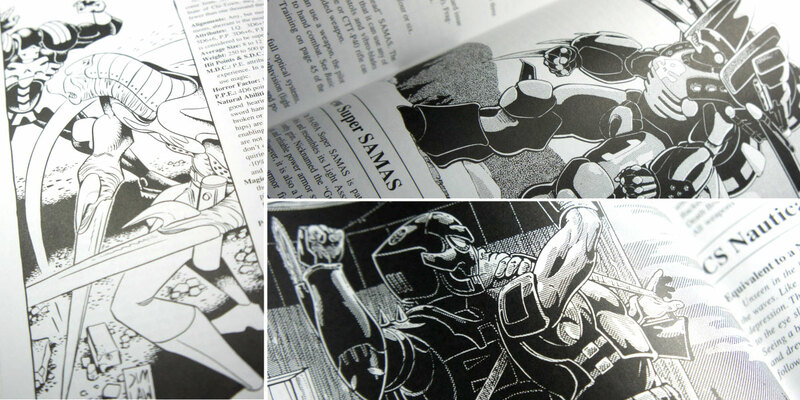 All the other illustrations in these books were just one-offs, a single image/pose of a character or robot. When drawing these types of illustrations you only have to worry about the one pose and making it look good from one angle; but what if you needed to draw the same thing in different poses… How would the armour joints move? Where does the clothing connect & drape on the other side? This comic made me start thinking about how all my own drawings would function if they were stuck in our world, with our laws of physics. It made me want to start adding depth to the characters without the need to explain it. Making the characters personality, culture, and history come through in a single image, while knowing that I could show/explain how any part worked/moved if needed. Looking back, I can definitely say these books were one of those key factors in my life that made me push myself to keep learning and practicing. 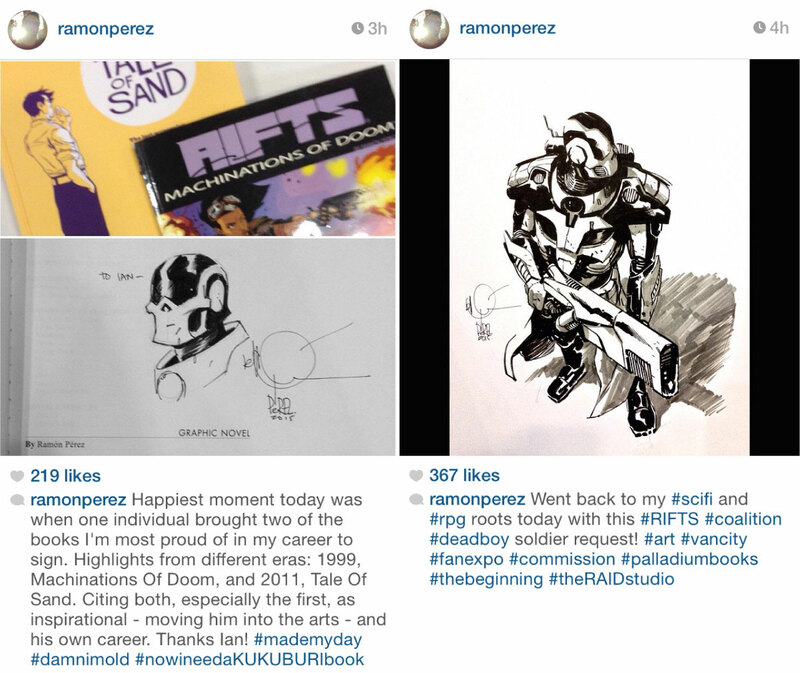 I specifically contribute the work of Ramón Pérez as one of those things that made me seriously focus on getting better, to the point I was able to move beyond just doing it as a hobby and eventually go to school for design & illustration, and become a full time artist. 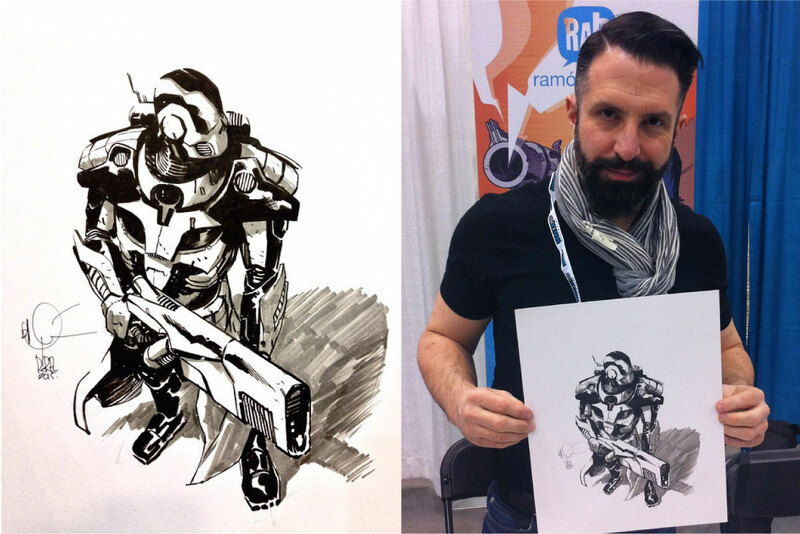 When I was still living in Vancouver I was able to attend the very first FanExpo. It wasn’t the biggest Comic Con type event, but it was a ton of fun. I loved walking through the crowds, seeing all the people in costume, actors signing autographs and nerd paraphernalia, but my favorite part was the artist alley. Getting to see all these amazing artist showing their work and sketching commissions, proving that if you work hard enough at your craft there was a way to do what you love as a career. After moving back to Vancouver Island I stopped attending simply due to travel, time, and cost, but this year I had to make an exception. The day before it started, a friend posted about going and some of the celebrities that would be signing, including William Shatner and Carrie Fisher. Although cool, it wasn’t quite my thing, but as I was browsing through the event site to see what other attractions would be there, a familiar name jumped out at me… that’s right, Ramón Pérez. Not only was he attending as an artist but also in a sketching duel and hosting a workshop. I had to try and make it. I called a couple friends I knew would be interested in other aspects of the event, the three of us cancelled our other plans and headed to Vancouver. It was great to see how much the event has grown, literally double the floor space from the last time I went, and the obvious support the public had given to this relatively new annual event. This of course meant even more to look at… cosplayers, comics, various nerd merch, video games, huge Lego displays… It was awesome. And as I hoped the draw for me had grown too. The artist alley was a lot bigger with a lot of artists I recognized and admired, but I had one specific person I was there to see. I can admit I was a bit nervous. Like a sports fan memorizing a players stats, I had devoted a lot of time and thought to a person that I thought I would never meet. I had no idea what he would be like in person, and like anyone, I had that split second hesitation that they might not live up to some expectation I might have. Of course I got over it, and approached with my copies of Mechinations of Doom and Tales of Sand ready to be signed, and was greeted with a very friendly smile. I was actually a little caught off guard with how casual and humble he was. I’m not sure what I expected, but to me this was like meeting your favorite celebrity, so I kinda assumed it would be more like all the others standing in the long line to meet Princess Leia. Go up, say hi, wait patiently for a signature, say thank you, and walk away… but not the case. He was very welcoming as I asked him to sign my two books, which I took as an opportunity to express the significance of meeting him. He seemed appreciative of my story as I explained his affect on my career. I even got to share some rough sketches from the graphic novel my brother and I have been working on. Naturally I had to get a commission sketch to hang in my office. I was going back a forth about what I would want as we sat on the ferry heading to Vancouver, but it became obvious while standing in front of him with one the books that meant so much to me… I simply asked for a surprise of a character from that book. He asked when I would like it by, and since I was only over for the day I had to leave early to try and catch a ferry back home. He generously offered to fit it in so I could pick it up just in time before I needed to leave. I was in awe of the result. It was perfect. And I now have this illustration hanging over my desk as a continuous reminder of not only what got me seriously interested in illustration in the first place but also what I still aspire to. I’m not really sure what I thought would happen by rushing over that day, but it definitely turned out to be one I won’t forget.